By mapping IT controls against predefined policy content, McAfee Policy Auditor helps you report consistently and accurately against key industry mandates and internal policies across your infrastructure or on specific targeted systems. Policy Auditor is an agent-based IT audit solution that leverages the Security Content Automation Protocol (SCAP) to automate the processes required for internal and external IT audits. Streamlined deployment and management — The McAfee ePolicy Orchestrator (ePO) platform provides easy Policy Auditor deployment, and simplified reporting and compliance management. Flexible policy formation — Within minutes, Policy Auditor allows for the creation of new policies designed by you, set by corporate governance, or from authoritative sites such as Federal Desktop Core Configuration (FDCC). Real-time audits and controls for setting the frequency of data capture deliver timely information for compliance. Predefined templates and controls — Policy Auditor comes with predefined benchmark templates and the ability to ensure protection of the business by employing blackout windows that halt data capture during key business periods. Lower the cost of validating compliance with advanced IT security auditing software. 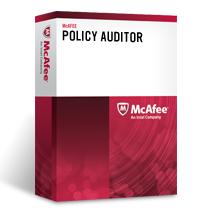 McAfee® Policy Auditor software offers an optimized approach. Integration and innovation produce real ROI and significant productivity gain while making audits painless and less expensive. Use prebuilt policy templates that eliminate manual effort and demonstrate adherence to key industry mandates and internal governance policies, including PCI DSS, SOX, GLBA, HIPAA, FISMA, and the best-practice frameworks ISO 27001 and COBIT. Policy Auditor includes a purpose-built PCI dashboard that delivers a consolidated view of the state of compliance by PCI requirement/control. Use McAfee ePolicy Orchestrator (ePO) software to lower cost of ownership by consolidating endpoint security management and compliance management, easing agent deployment, administration, and reporting. Integration with McAfee Vulnerability Manager enables organizations to consolidate agent and agentless audits. Keep updated on compliance standards. Security Content Automation Protocol (SCAP) validation by the National Institute of Standards and Technology (NIST) enables agencies to comply with the Federal Desktop Core Configuration (FDCC) standard. Create rules from any scripting language supported by the system being audited to extend the check capabilities of Policy Auditor. Sample languages include VBScript, batch files, Perl, and Python. Set the frequency of data capture to support automated reports with accurate data. To prevent disruption to critical business applications, a blackout window lets IT operations block audit data capture during key business periods. Download benchmarks from authoritative sites. Within minutes, view detailed security guidance to confirm regulatory compliance or design your own internal governance policies based on security community best practices. By mapping IT controls against predefined policy content, McAfee Policy Auditor software automates manual audit processes and helps you report consistently and accurately against internal and external policies. McAfee Policy Auditor software ships with benchmark templates for a variety of compliance mandates: PCI DSS, (Policy Auditor includes a PCI dashboard that delivers a consolidated view of the state of compliance by PCI requirements/controls) SOX, HIPAA, FISMA, and several others. It also supports the best-practice frameworks ISO 27001 and COBIT. Platforms covered include Microsoft Windows, Oracle Solaris, Red Hat Linux, CentOS, HP/UX, IBM AIX, and Apple Macintosh (Mac) OS-X platforms. Seamless integration with McAfee ePolicy Orchestrator® (McAfee ePO™) software eases agent deployment, management, and reporting. The single McAfee ePO console lowers cost of ownership by consolidating endpoint security management and compliance management. You save money on hardware, training, and operational costs and get unified control over the policies and protection on each host. Organizations can run consolidated audits across both managed (agent-based) and unmanaged (agentless) systems. From the McAfee ePO console, they can define and select a unified policy benchmark once and have the assessment performed across many different asset types. This reduces the effort needed to run audits and, for the first time, provides organizations with a single, unified report across all assets. Create rules from any scripting language supported by the system being audited to extend the check capabilities of policy agents further. Sample languages include VBScript, batch files, Perl, and Python. Four McAfee Policy Auditor software tabs in the McAfee ePO console make it easy to deploy policies and manage audit processes. Through SCAP support and its own innovative engineering, McAfee helps you validate compliance easily, even when benchmarks and policies change. Download benchmarks from authoritative sites, such as the Federal Desktop Core Configuration (FDCC) benchmark on the NIST website, and view detailed security guidance to benchmarks. Uniform benchmarks limit misinterpretations among security teams and external auditors. An innovative continuous audit model helps security and audit teams ensure data is current and accurate. It eliminates manual data generation for internal and external audits. To prevent disruption to critical business applications, a blackout window lets IT operations specify times when audits may not be conducted. Audits are never convenient, but they can now be less disruptive. You can document and grant waivers to justify deviations from policy, and set expiration dates to limit exposure. When audits detect issues, McAfee ePO helps you create tickets and track them easily. Optional integrations let you push tickets to third-party trouble ticketing systems like BMC Remedy. Audit and remediate and then prevent unauthorized changes, ensuring continuous compliance to policy. Powerful, graphical dashboards help you measure, monitor, and report compliance. Download the McAfee Policy Auditor Datasheet (PDF).